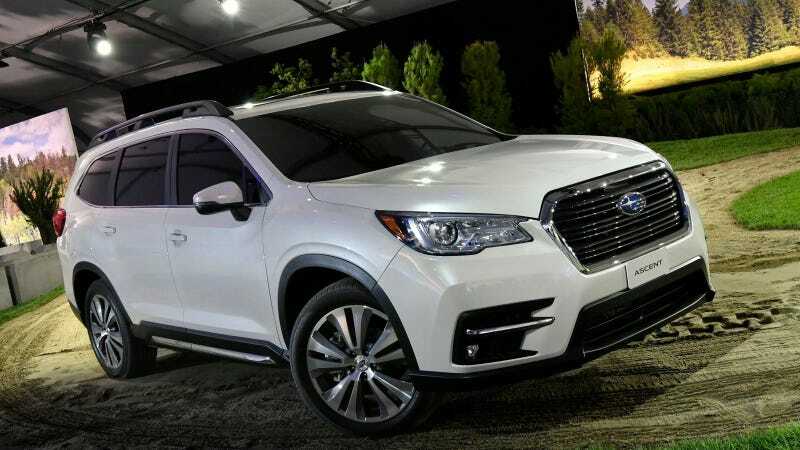 Autocar, a publication that can’t grasp the American dream of greatness, asks if the 19 cupholders in the new 2019 Subaru Ascent is “too many cupholders.” Jalopnik, a publication for HEROES, knows that 19 cupholders is simply called “not enough cupholders.” But the joy of so many cupholders is how much liquid it can contain. The Subaru Ascent, fittingly, will be made in America for the American market. And we do enjoy a tasty beverage here, which explains why the Subaru Ascent has 19 cupholders for its mere eight occupants. You’re probably just noticing that the number eight doesn’t really go into the number 19 neatly, but these are mere trivialities. What’s important is just how much liquid it can hold. You and your seven thirsty friends head off to your nearest 24-hour convenience and food-like nutritional item mart. If you all get your normal, 16-ounce, regular-sized 2.375 beverages per person, you’re looking at 304 ounces of sugar water, or coincidentally, 2.375 gallons of liquid. But as I alluded to before, this is America. We don’t stop at 38 ounces of fluid per person. Your food-like nutritional item mart sells a 30-ounce drink in one container, the Big Gulp, and since you like to Live Big and Drink Big, you’re looking at 71.25 ounces of fluid per person, which is exactly what you should be looking at. It’s patriotic duty. And since that’s more than twice the average human’s liquid stomach capacity, we should probably stop there. Why stop there, though? You sure as hell know that 7-Eleven doesn’t stop there. The largest drink container they make that can fit into a regulation-size cupholder is the Double Gulp, so-called because it is not quite double the regular-sized Big Gulp, at 50 ounces, and because it’s so unfathomably large that you’ll be gulping when you see it. Twice. With 19 cupholders, your Subaru can hold 950 fluid ounces. That’s nearly a gallon per person. That’s ridiculous. That’s 7.4 gallons of ridiculous, to be specific. But not the most ridiculous. We can go more ridiculous. That’s because 7-Eleven sells a monstrosity known as the Team Gulp. The Team Gulp, at 128 ounces, is a strong contender for the title of The Peak of Human Achievement. And while it likely cannot fit into the cupholders of a Subaru Ascent, challenges are meant to be surmounted. You and seven of your friends are going to have to hold onto these bad boys yourselves. In keeping with the trend, let’s assume each of you gets 2.375 Team Gulps. You each get 304 fluid ounces. Your Subaru Ascent will be containing eight extremely well-hydrated humans, and 19 gallons of liquid to match its 19 cupholders. For argument’s sake, let’s say you get some delicious, refreshing Mountain Dew™. Your Subaru will be holding eight humans, 19 gallons, and 35,264 calories of quintessential Americana. That’s 4,408 calories of Mountain Dew™ per person. Mr. Trump says we need to “make America great again.” I believe we’re already there, and nobody understands this better than Subaru.